Braving the breeze fresh from the Indian Ocean I met up with Community Newspapers journo Jess Nico and photographer Jon Hewson. 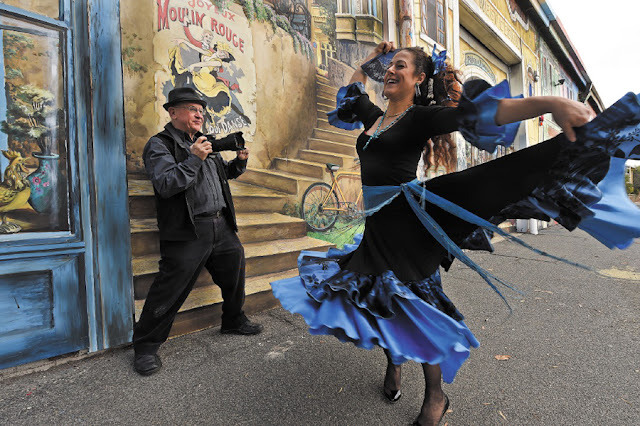 French dancer Yamina from Beleza Entertainment braved the elements and stopped the traffic in South Terrace. Using the East-West Trading Company in South Fremantle street murals as a backdrop, Yamina twirled for the cameras. All for a worthy cause - the 2015 International Portrait Prize and the Arthritis Foundation of Western Australia. Community Newspapers are generous sponsors of the 2015 Fremantle International Portrait Prize. Read Jess Nico's story in the Community Newspapers. Photographers everywhere are invited to enter the 2015 Fremantle International Portrait Prize. Click HERE for details. AU$12,000 in cash and prizes.